My name is Bülent. 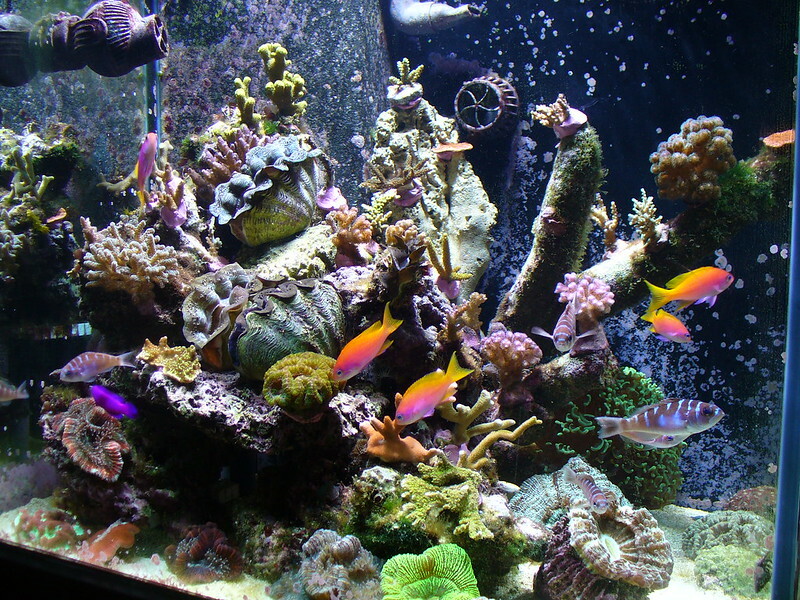 I began reefkeeping in November 2008. However, I still consider myself as a novice. I live in Sheffield, United Kingdom. I have been a member of this forum since December 2009 and have learned a great deal from its members. 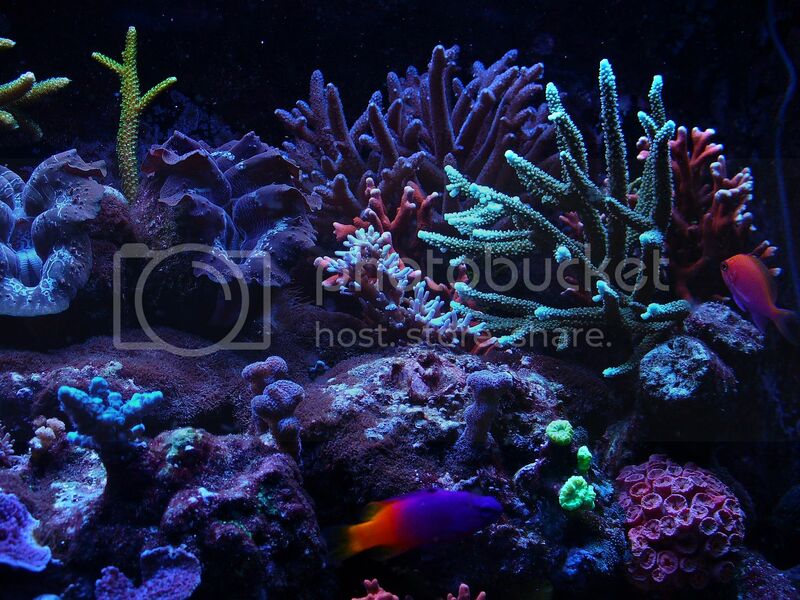 There are so many very nice looking reef tanks presented in various tank threads that I have found it rather intimidating to start my own tank thread (until today that is). However, I am now taking the plunge and starting my thread. My main objective in this thread is to share my experience and observations with you and to learn from you if you decide to contribute. I am not a scientist. Thus, the best I can offer to you is anecdotal evidence. If you expect scientific justification for my arguments, you will be disappointed as I do not have the resources and time to carry out repeatable controlled experiments to justify my observations. 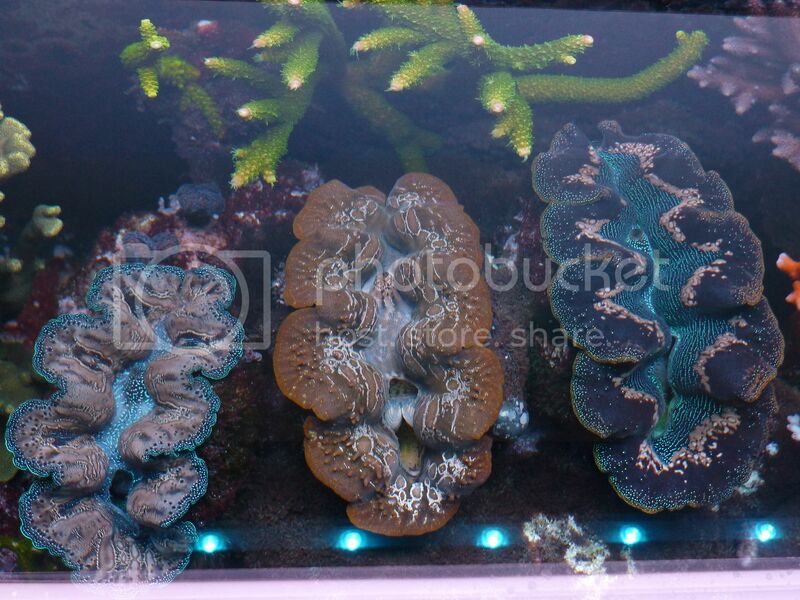 Anyway, before describing my present reef set up, I would like to share a few pictures of my previous set ups. 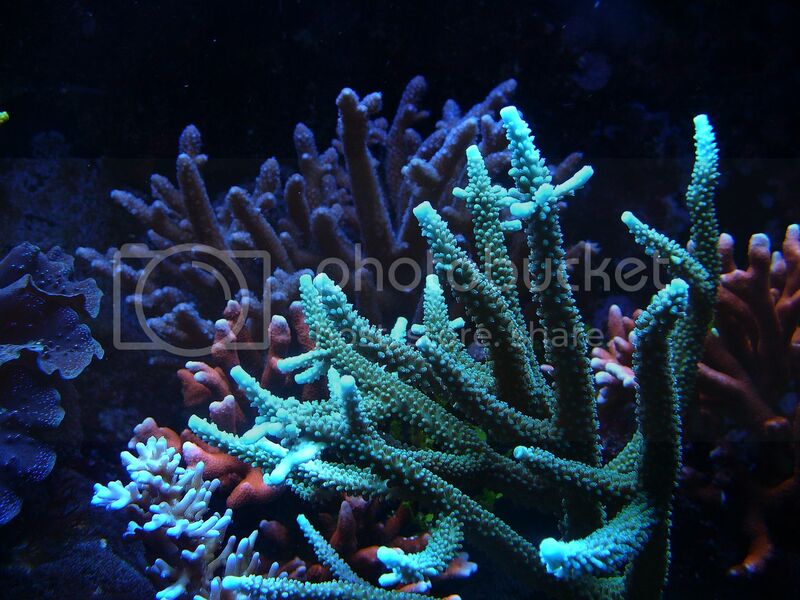 The reason why I am starting my thread in this way is to establish a few principles that underpin my reef keeping. 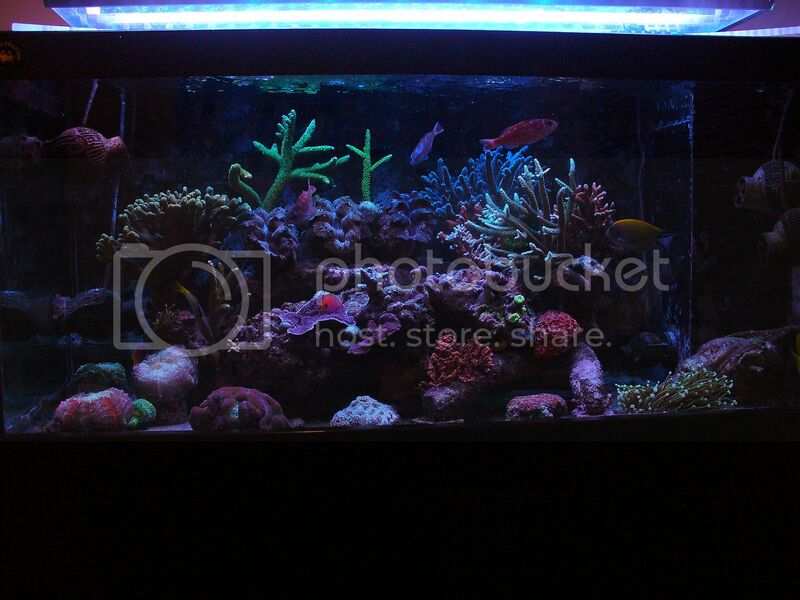 My first reef set up was a 94-lt nano tank. I kept it for about 30 months. I also successfully bred Bangaii cardinals in this tank. I kept this tank under a year. Just when it started to look nice, it suddenly developed a leak, which meant that all my live stock ended up in temporary accommodation. I kept my corals and fishes in two separate containers. 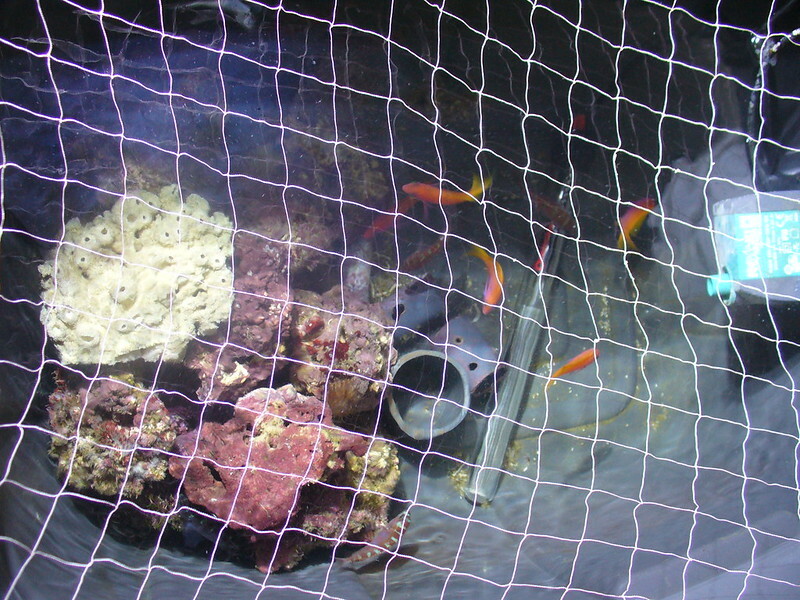 I made a huge mistake by putting my skimmer in the coral container instead of fish container. 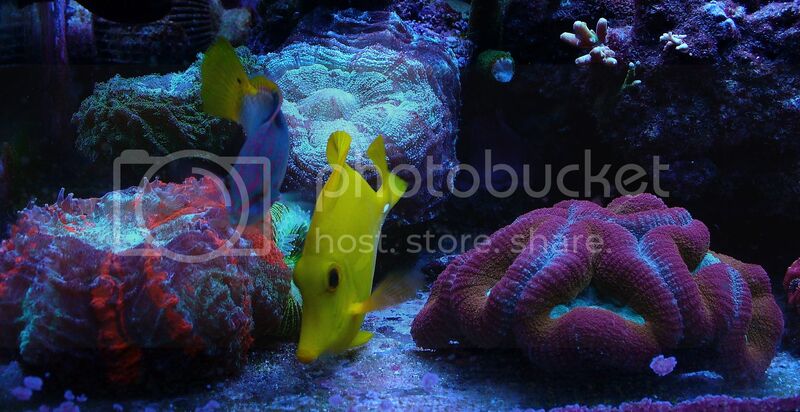 As a result, I the lost majority of my fish, including my beautiful female bimac anthias. I still carry the scars of this bad experience today. 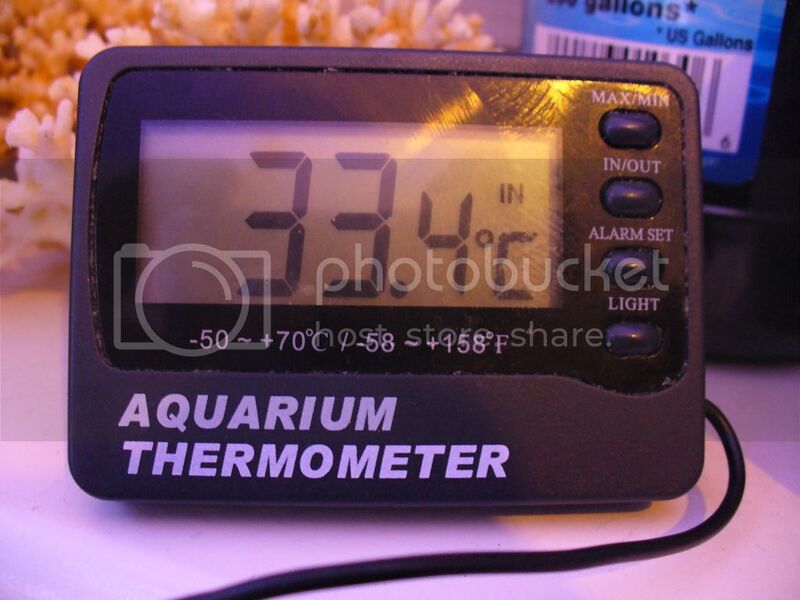 My present tank was commissioned in February 2012 and was installed a month later. I will provide its details, including its equipment list with pictures in my next post. 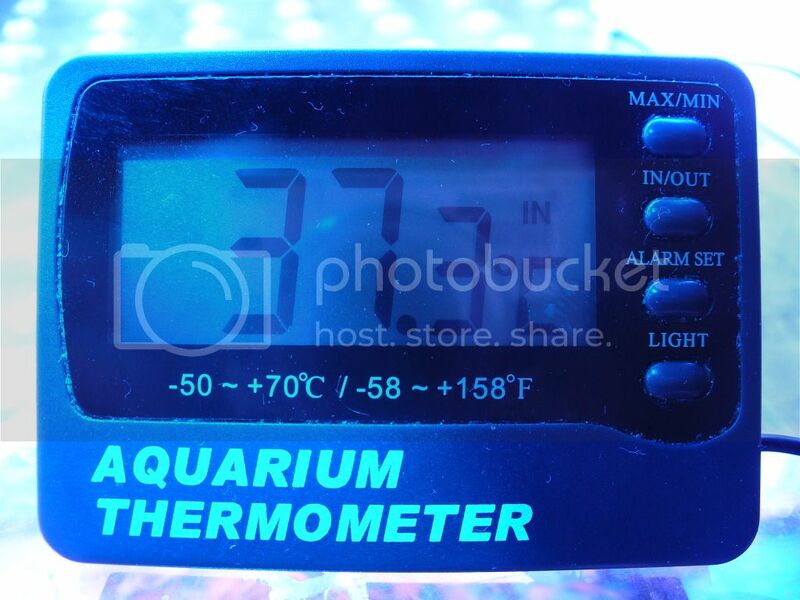 The gross volume of the display tank (40" (L) X 21" (W) X 18" (H)) is about 65 (US) gallon. 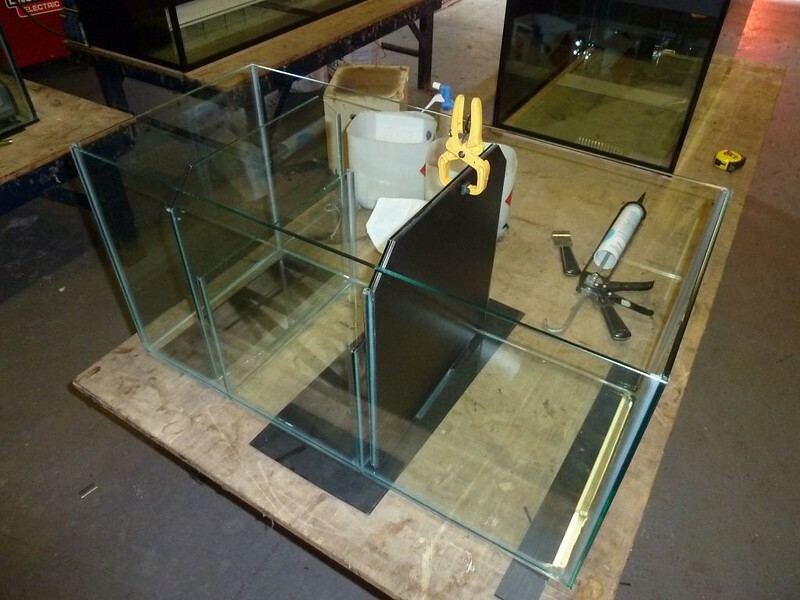 The gross volume of the sump (32" (L) X 15" (W) X 16" (H)) is about 125 litres. The tank was built in March 2012. 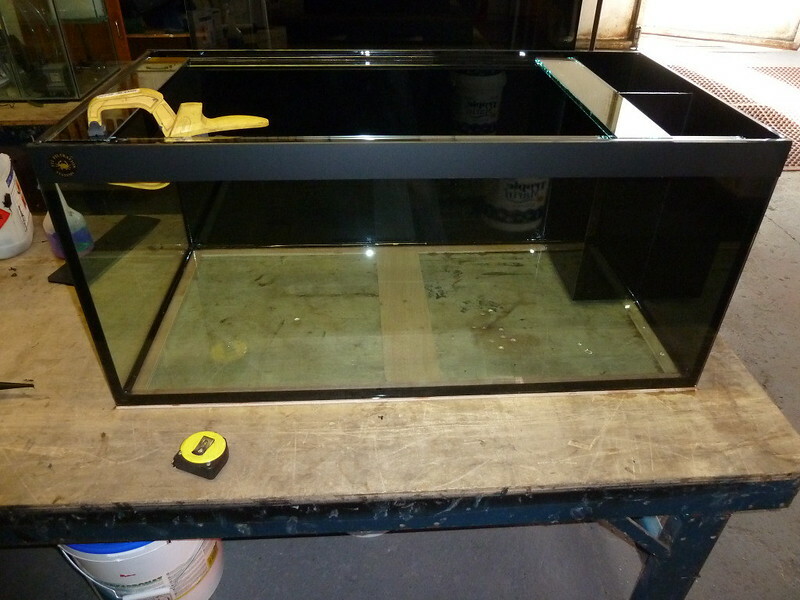 I went for a shallow tank this time as I found my previous tank, which was 24" high, difficult to maintain. The tank builder suggested that the weir be placed back to front, so that when I look at the tank my eyes would not be drawn to it. Surprisingly it works. The sump has three compartments as shown below. The rightmost section is where the water from the display tank drains into and where the skimmer is located. 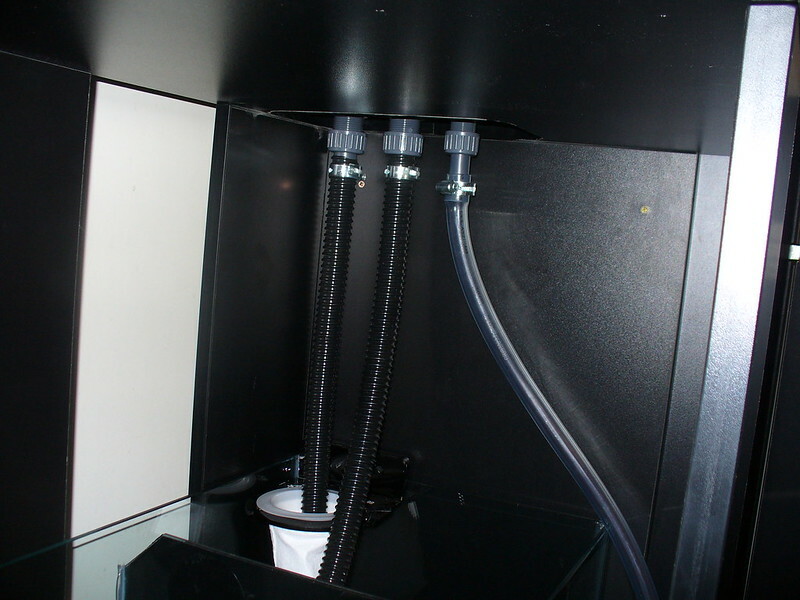 The purpose of the black acrylic is to provide a dark zone for various water filtering organisms. 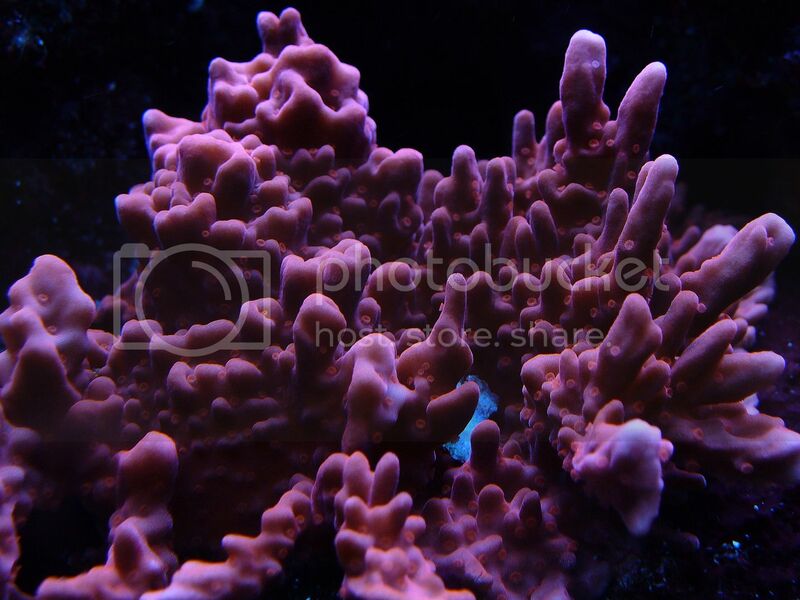 It also prevents coralline algae forming on the body of the skimmer. 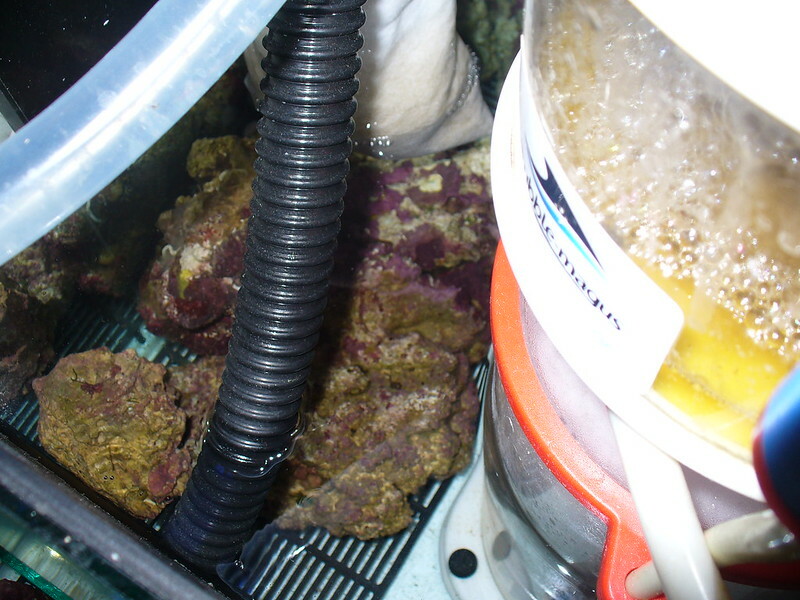 I also use a filter sock (only when I baste rocks) and a number of fist-size live rocks to encourage sponges, pods, etc. 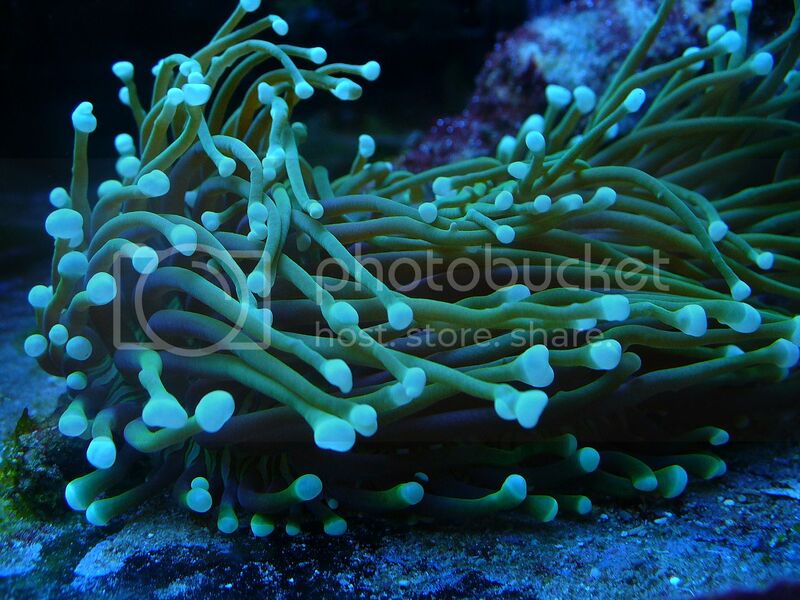 The middle section of the sump houses chaeto for nutrient export. I use a DIY light unit over it. 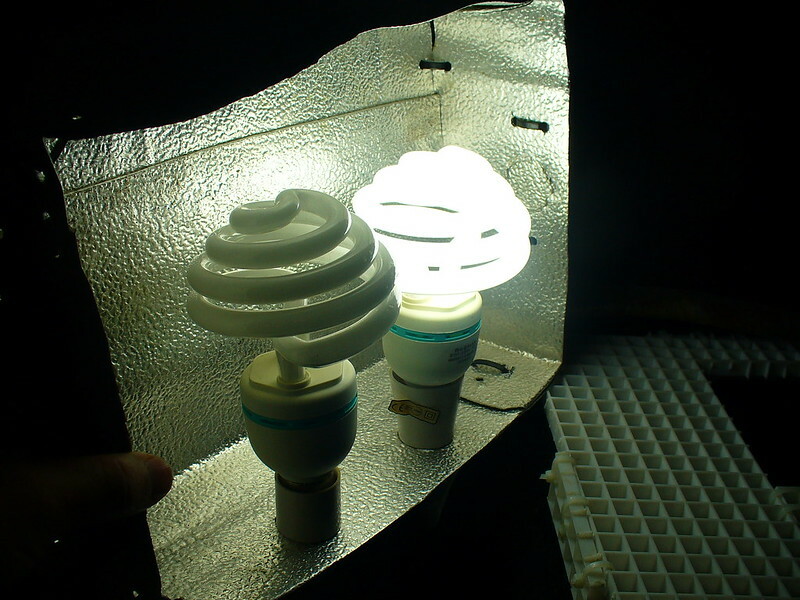 The lamps are 36W each (6500K) and are very effective. I replace them every six months. I remove about 1000 ml chaeto every ten days. The return section houses the return pump (Sicce Syncra Silent 2.5), which turns over the entire volume of the set up about 7 times per hour, the probe of my Pinpoint pH monitor, the hose and two sensors of my Tunze Osmolator 3155 auto top-up device, and two Phosban 150 reactors. I fluidise GAC (Rox 0.8) and GFO (Rowa Phos) as and when required. 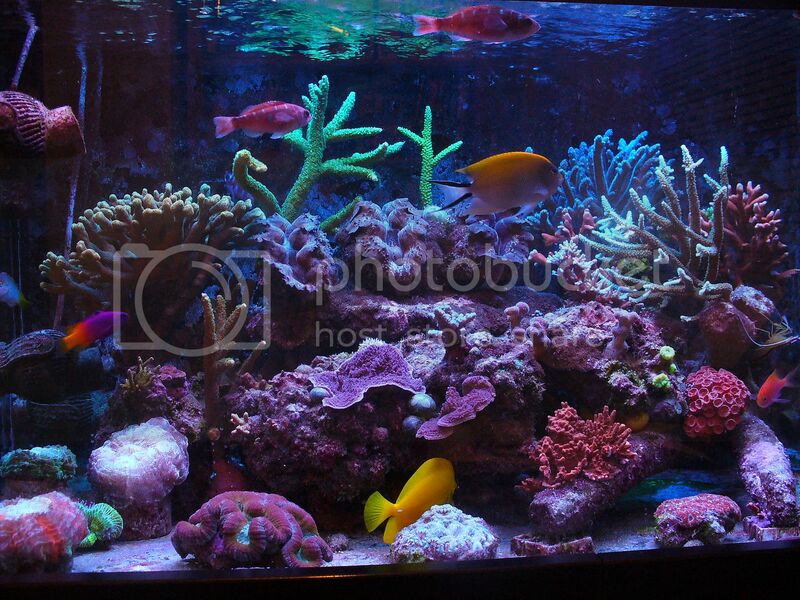 The plumbing doesn't have any ball or gate valve to regulate the water level in the display tank. It does not need any solvent glue either to put together. 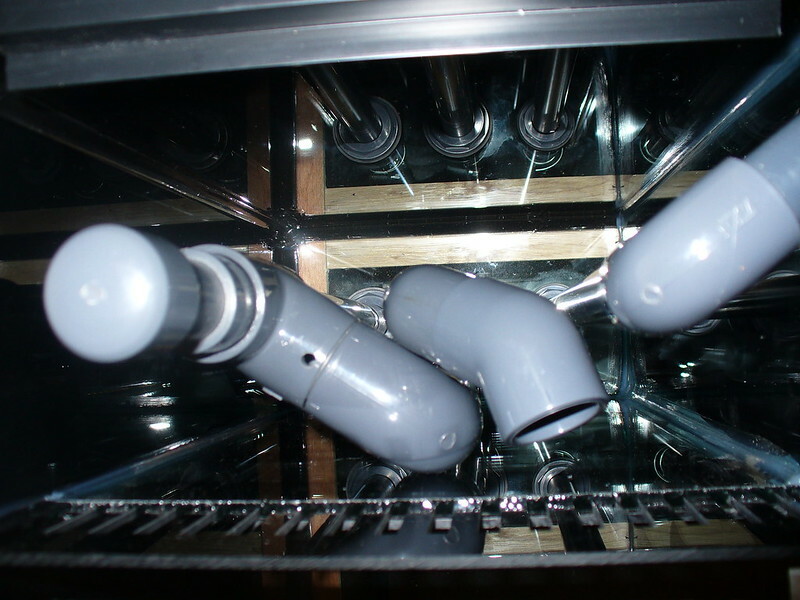 However, the clamps need to be really tight in order to prevent air being sucked in, which can disturb the way drainage works. 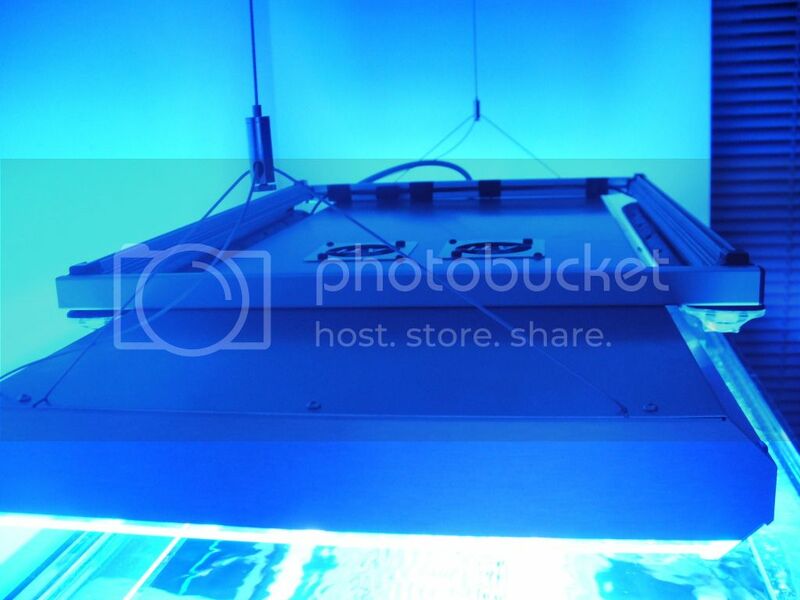 In my next post, I will provide the light specification and the specification of the entire set up, including the live stock. Last edited by DiscusHeckel; 07/24/2017 at 03:16 PM. I really like the dimensions and have been thinking about having a tank built of similar size in the near future. I was thinking of going 38"(L) x 24"(W) x 14"(H), but looking forward to seeing how everything looks. Interesting drain system as well, never seen that before. I really like the dimensions and have been thinking about having a tank built of similar size in the near future. I was thinking of going 38"(L) x 24"(W) x 14"(H), but looking forward to seeing how everything looks. Thanks. 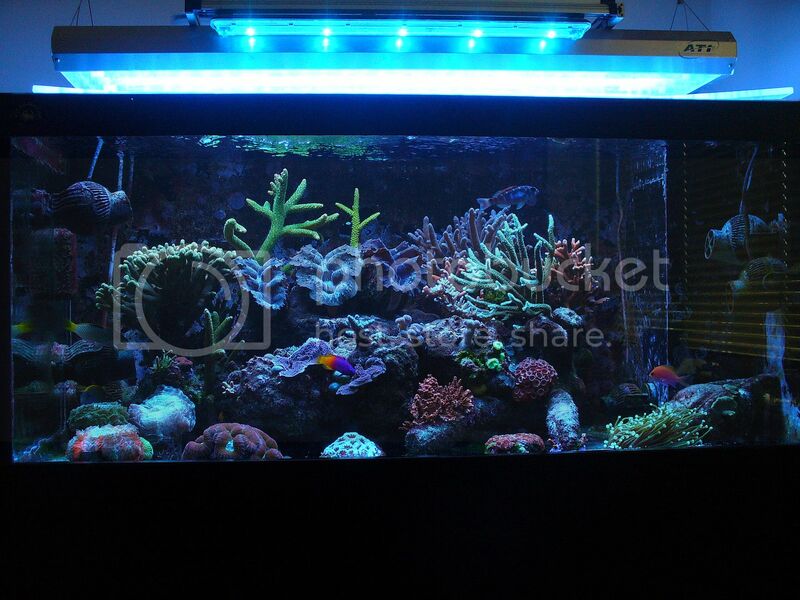 You may wish to have a look at the "Shallow reef tank club" thread. 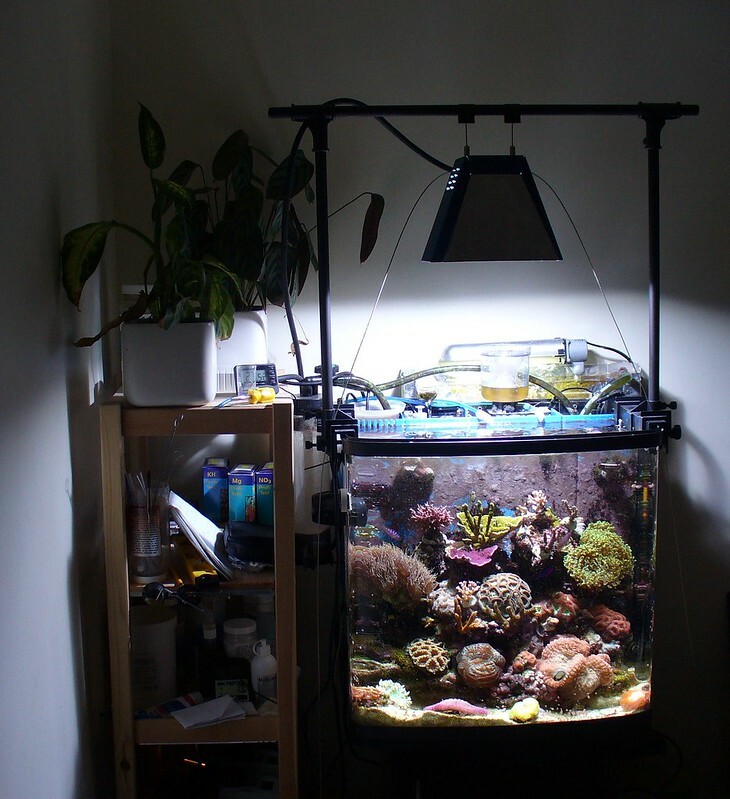 You will get a good idea about what your tank will look like. I posted some pictures of my tank in that thread, but will certainly put many more in this thread. 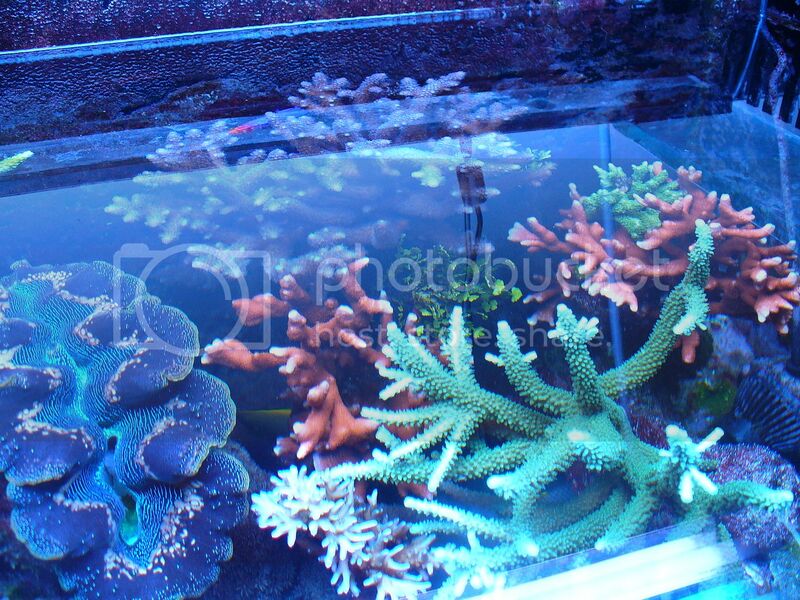 If I wanted a shallow tank similar to your proposed dimensions, I would probably go for a wider tank than 24" in order to spread corals to a wider area. Interesting drain system as well, never seen that before. The drain system is good, but it has its disadvantages. 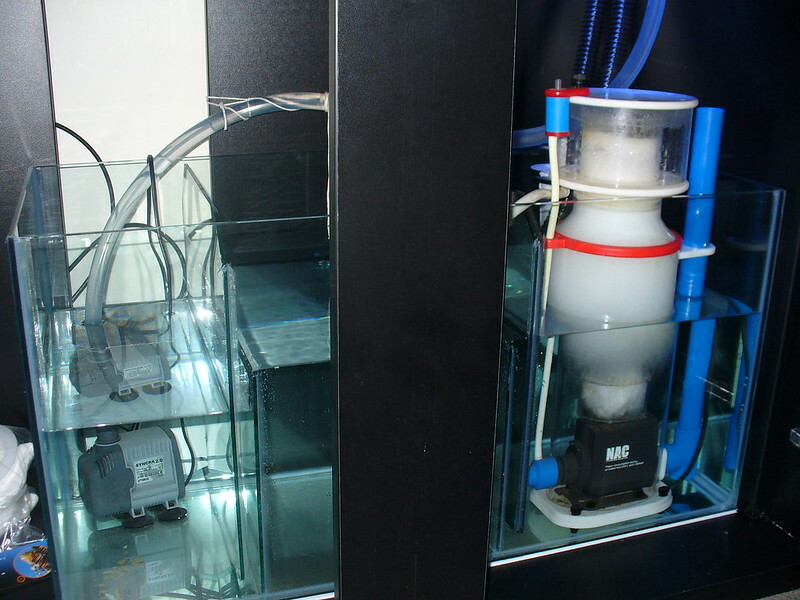 For example, you need to choose a fairly powerful pump to keep up with the amount of water draining down the drain to maintain stable water level in the display tank. Additional water drains through the interface between the knob and the pipe. In addition, the knob has a tendency to stick to the main pipe after a while due to calcification and needs cleaning periodically. 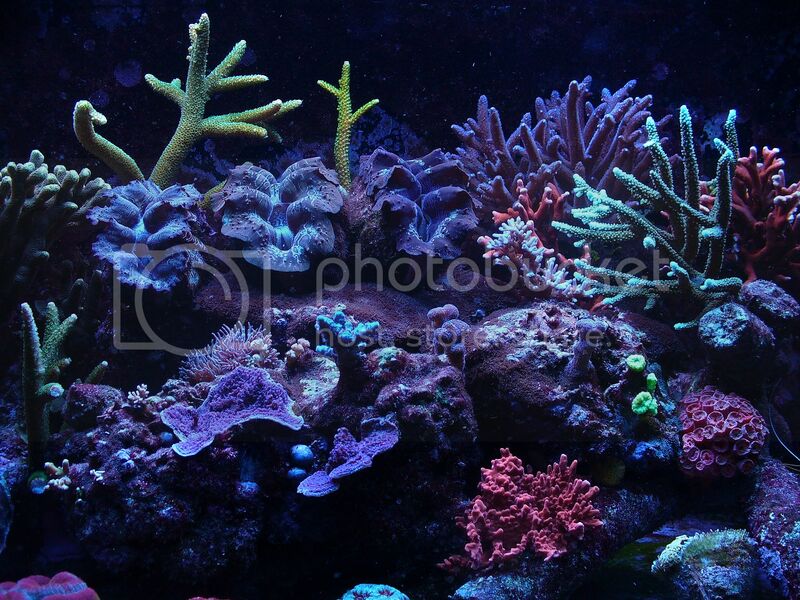 LPS Corals: Acantophyllia deshayesiana, Acanthastrea lordhowensis, Trachyphyllia spp., Heliofungia actiniformis, Blastomussa Welsii, Lobophyllia hemprichii, Caulastrea curvata, Duncanopsammia axifuga. Last edited by DiscusHeckel; 05/04/2014 at 07:32 PM. 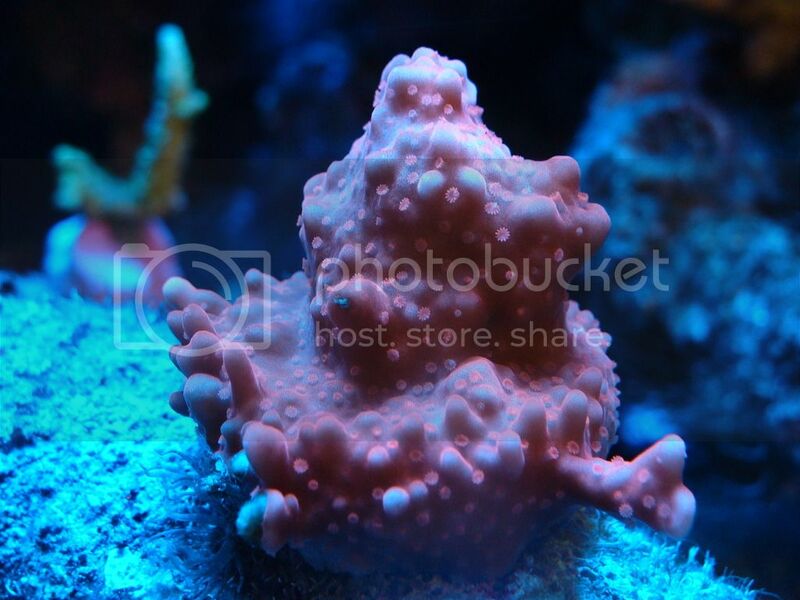 Montipora setosa is my most favourite coral. 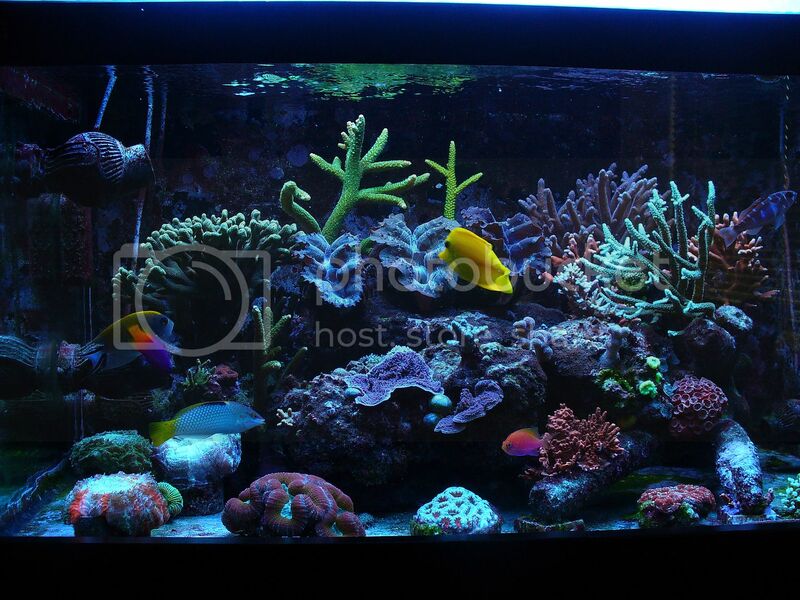 I purchased it from a fellow reefer in April 2012 and placed it on the sand bed. 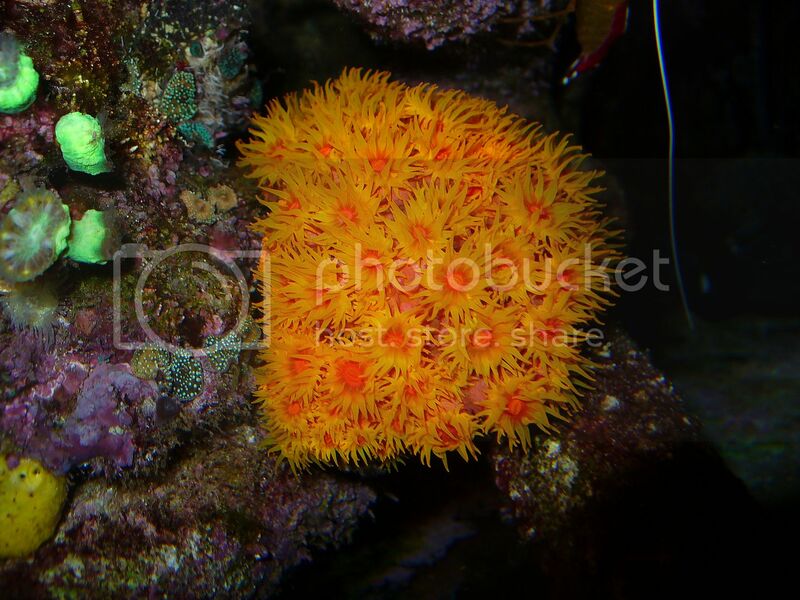 After realising that this coral requires brighter illumination than I previously thought, I placed it on a branching rock and allowed it to spread on the rock structure. 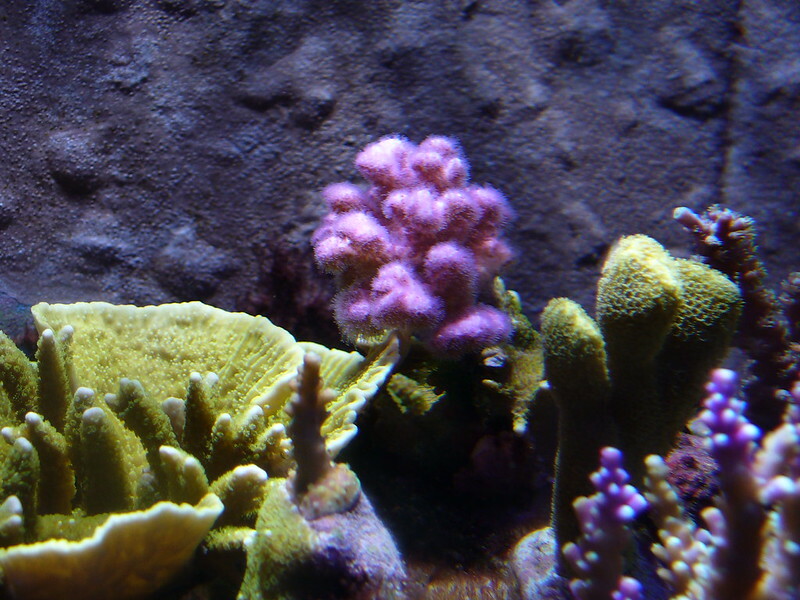 The coral has been growing at a steady pace ever since. (16th January 2013). 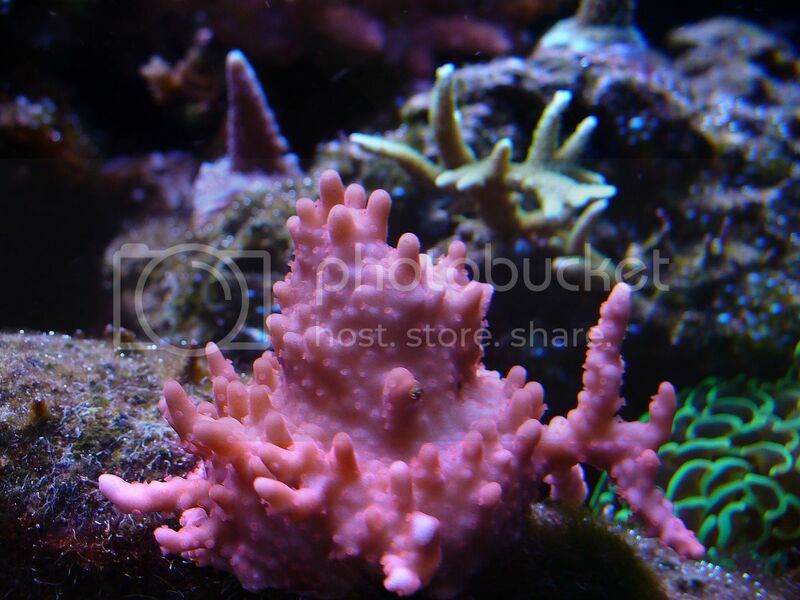 This coral has grown from a tiny frag (0.75") to 4" colony in two years I am more than happy with it. 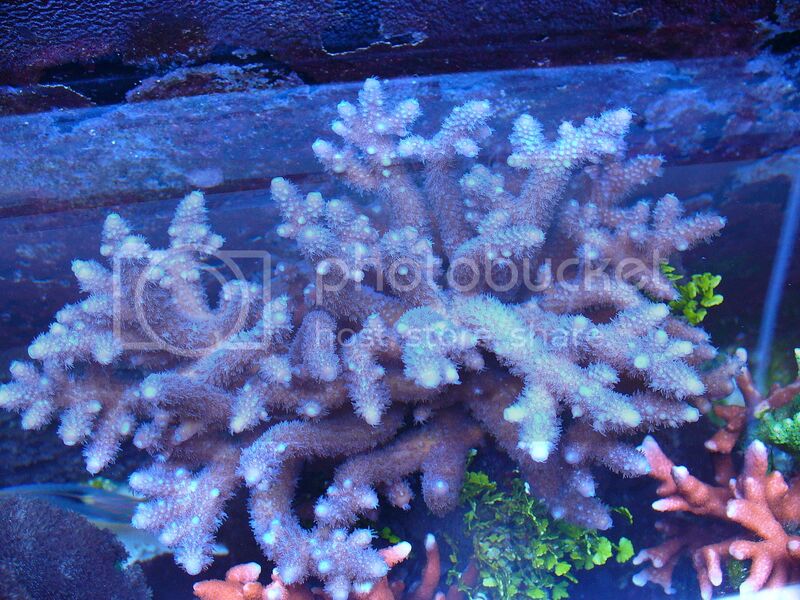 FWIW, this coral receives around 250 mmol PAR and has been kept directly under ATI blue + & KZ Fiji Purple/ATI purple +/ATI Coral + combination plus TMC reef blue LEDs. 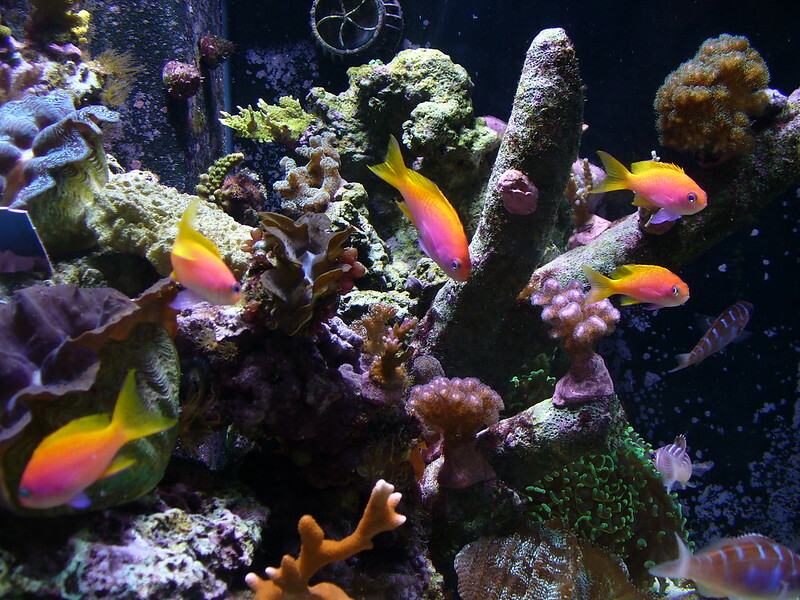 This post is a summary of events (extracted from my log book) related to cyanobacteria infestation in my tank and is essentially a note to self. The problem began on 7th August 2013 when I came back from my summer vacation. 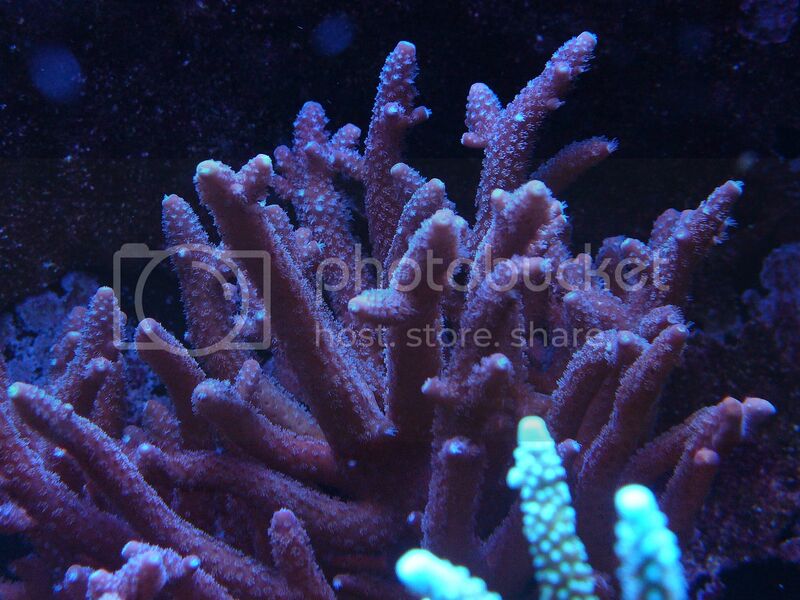 All my corals were OK, but their polyp expansion was rather poor and their colour was rather pale. This was not surprising because I instructed my neighbour not to feed my fish heavily. 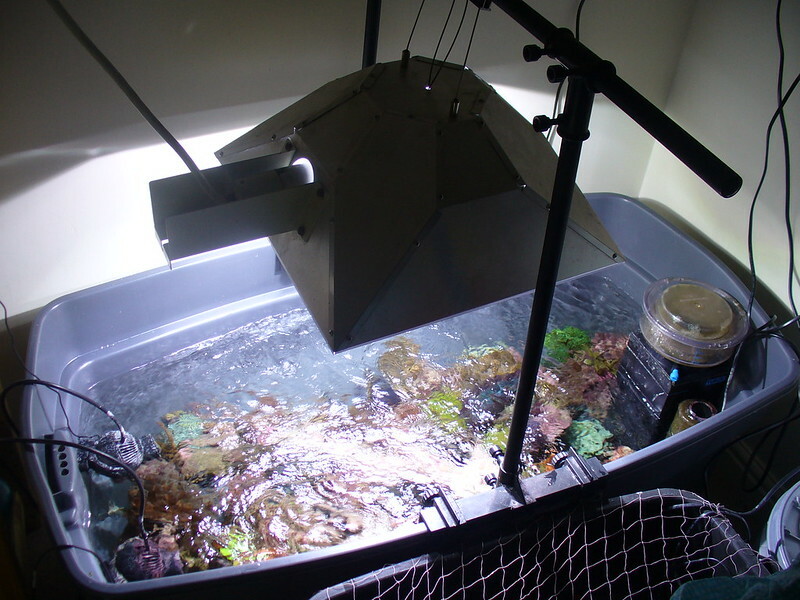 After a short period of cogitation and rumination, I decided that in order to improve my corals' vigour I needed to provide more food to them. 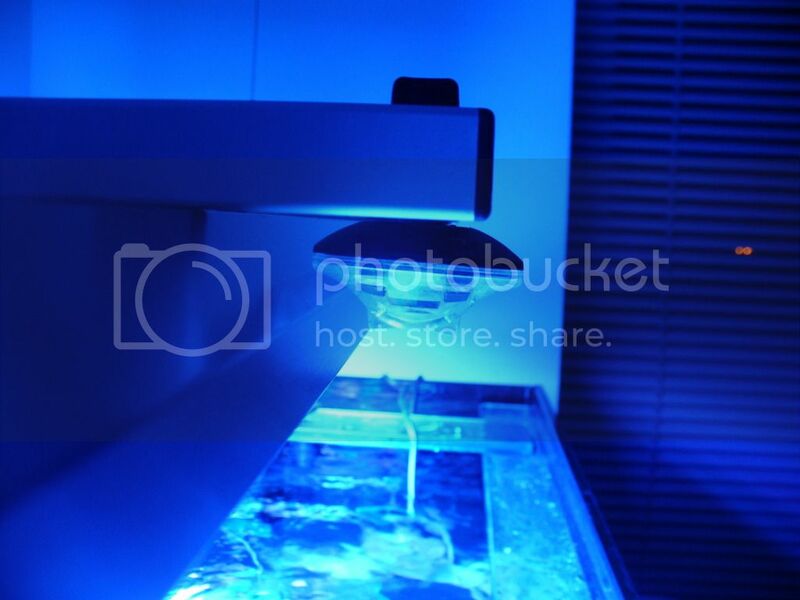 Thus, heavy feeding of fish commenced on 10th August 2013 (up to four times a day using frozen food only). After only five days, I noticed significant increase in poly expansion. I was therefore on the right track. 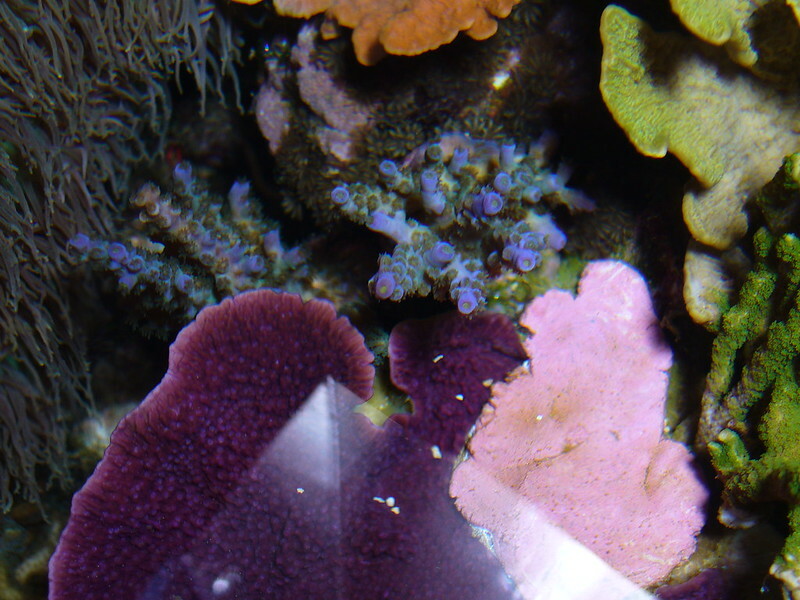 In addition to feeding fish heavily, I also fed my corals with Salifert's Amino acids once a week (using the suggested maximum dose). First signs of cyanobacteria appeared on rocks on 27th August 2013. I did not do anything about it and continued to feed heavily while continuing to dose Amino acids, iodine, iron and potassium (as and when required). GAC and GFO were fluidised on and off until 23rd December 2013, which was the date when I stopped using them completely. 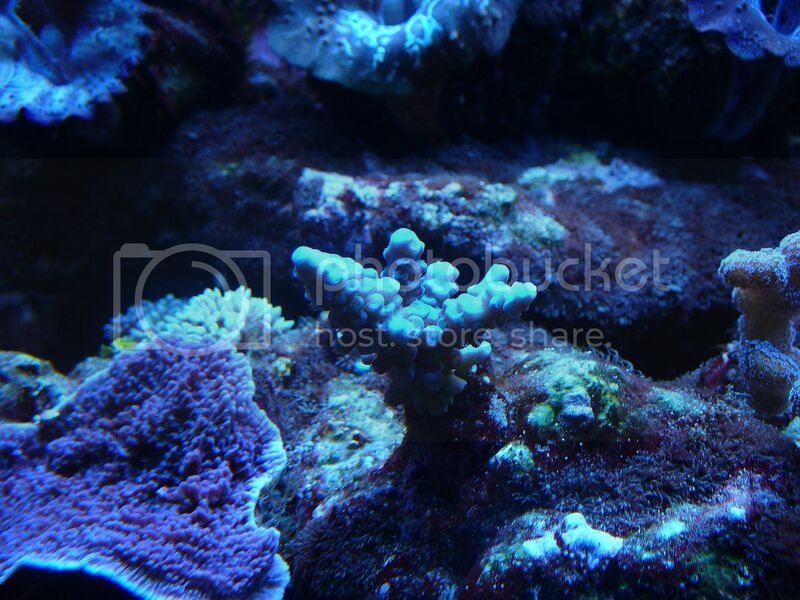 The end result was that the corals looked really healthy, their colouration and growth improved significantly. Looking back, my strategy, which was based on heavy nutrient input and export, had a major flaw in it. That was that I do not think I was able to export as much nutrients as I introduced to the tank. 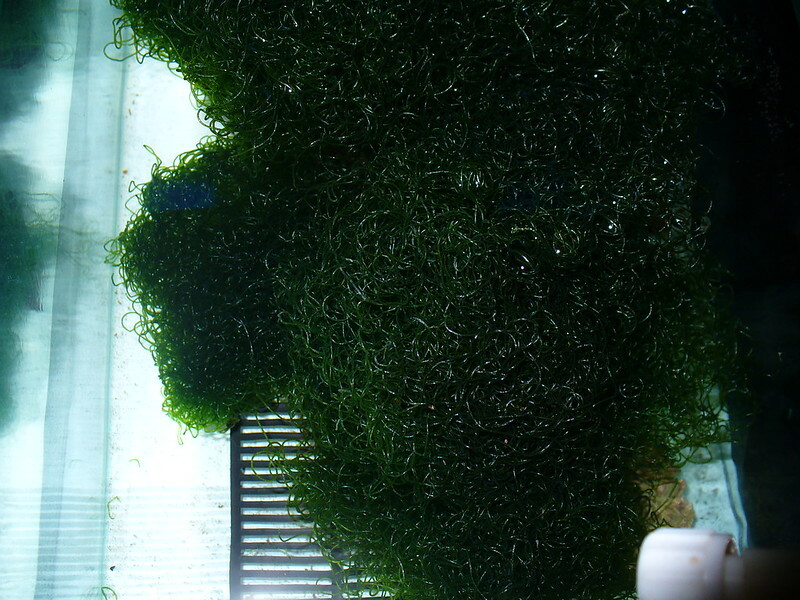 Because chaeto in my sump grew vigorously, nitrate and phosphate test results were really low (NO3 0-0.1 ppm; PO4 0-0.008 mg/l) and there were no green hair algae on rocks, I mistakenly thought that I was exporting enough nutrients to offset the heavy feeding. My mistake was to ignore one of the major signs of rapid organics build up, cyanobacteria . One of my worst fears is to cause RTN/STN on my acroporids. My excessive use of GAC and GFO in the past sometimes resulted in RTN/STN. For this reason, I have been using fairly modest amounts of GFO and GAC. I try to replace GAC every 14 days and GFO every two/ three weeks. 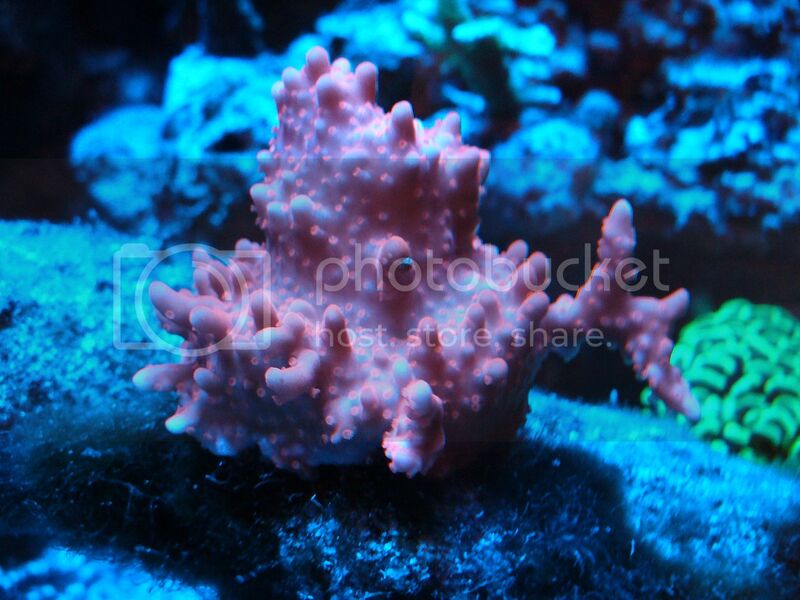 I had the same cyanobacteria problem twice before (once in my nano tank and once in my second tank). The steps, which I outlined above, always worked for me. For this reason, this is what I always recommend people they do when they experience cyanobacteria. 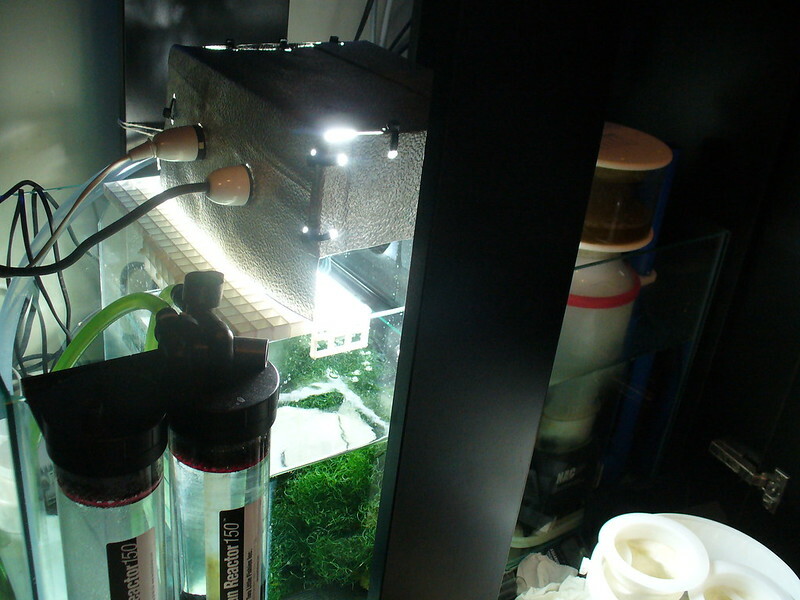 The only difference this time round must be to do with the fact that I never fed my fish as heavily as I did this time round and that I never allowed cyanobacteria to get a firm grip in my previous tanks and took measures before they got out of hand. Inevitably, new measures were needed to address the shortcomings of the existing steps outlined above. I therefore introduced three further steps on 17th April 2014. 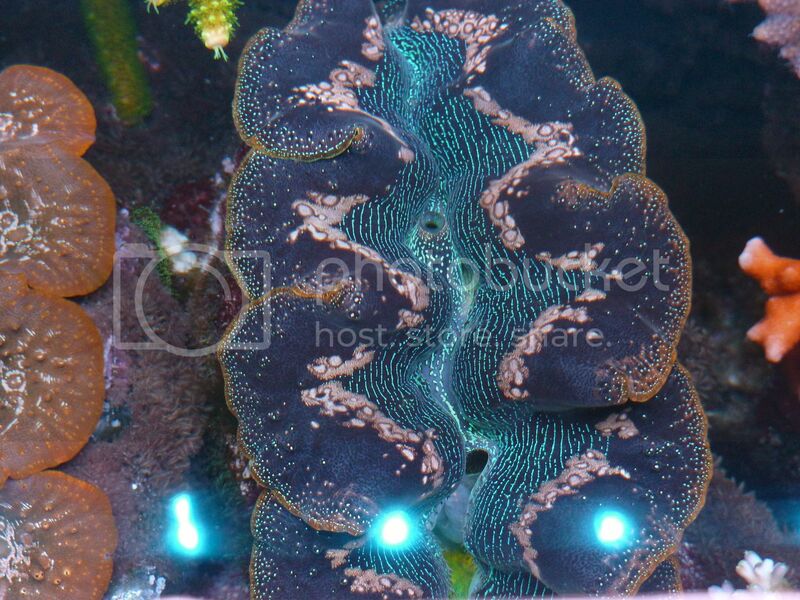 After the lights come on, cyanobacteria no longer show up immediately if at all. I have noticed that coralline algae have already started to grow on some brushed surfaces, which were previously occupied by cyanobacteria. 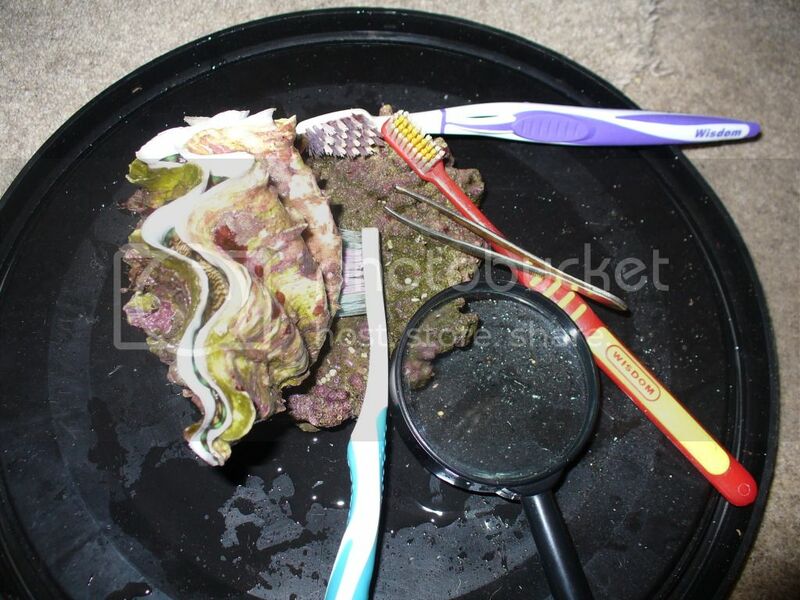 On some surfaces, cyanobacteria no longer show up before brushing and blowing commences. The new procedure (i.e. STEP 7 to STEP 9) is clearly working. I reduced the frequency of basting of rocks from every day to once every three days. The only place I can see signs of cyanobacteria is sand around the giant snail shell. The wrasse splashes sand from inside the shell while getting in and out. I have also started to change water in regular intervals (~12% every 6 to 7 days). The new procedure (i.e. STEP 7 to STEP 9) has worked. In order to find out if cyano woud reappear, I did not baste my rocks for six days. I did not use a filter sock either. Fortunately, cyanobacteria did not reappear. Interestingly, as the cyanobacteria subsided I started to get green algae growth on glass (not hair algae). I guess that eradication of cyanobacteria, which are great nutrient sink, increases the amount of nutrients in my tank, which then encourages other life forms to take cyanobacteria's place. There must be a shift of balance going on in my tank at present, which is a welcome development. It is such a relief that I have addressed the problem without resorting to chemicals or potions. I do not believe that Redfield ratio can be one of the main causes of cyanobacteria because cyanobacteria can fix nitrogen and phosphorus even when nitrates and phosphates are very low in surrounding waters. They fix these life building elements extracellularly from organics. Hence, the reduction of DOCs is of paramount importance if battle against cyanobacteria is to succeed. Big E (Ed) suggested this method to me. 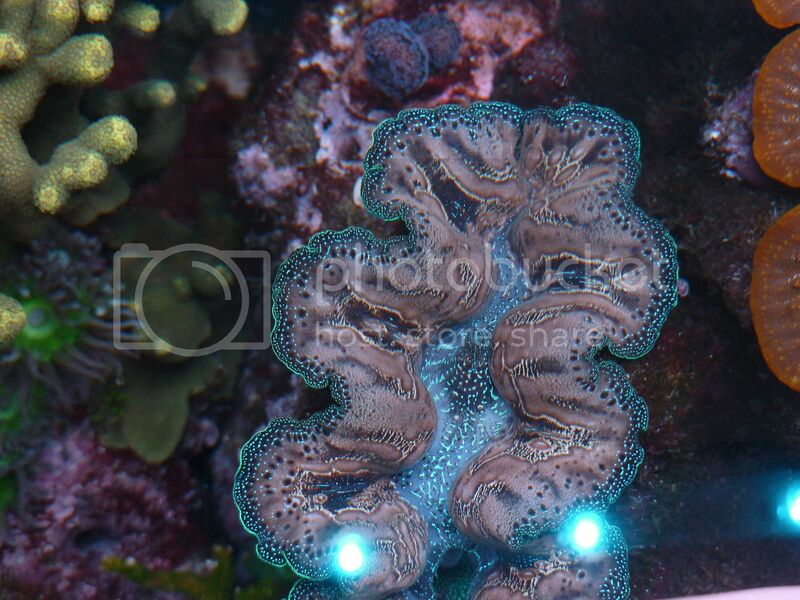 I have three Tridacna croca clams in my tank. Their sizes vary between 4.5" to 6". 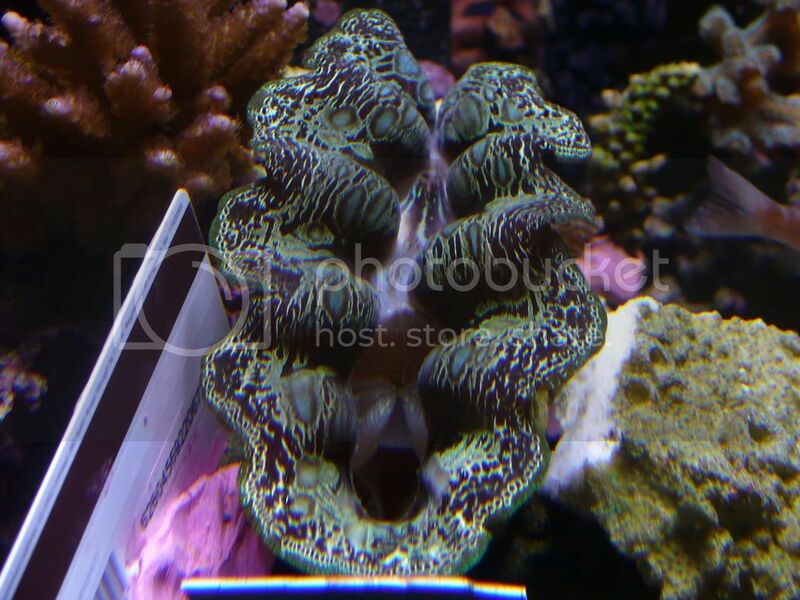 The oldest clam, which is the one in the middle, has been in my tanks since September 2011. Ensuring that a clam attaches to a surface is sometimes easier said than done. Some people claim that if a clam does not attach to a surface it must be unhappy. My experience suggests that a clam can attach to any surface providing that it is forced to do so in a humane way and will stay attached unless it is removed by brute force, or it dies. I used plastic cards (e.g. 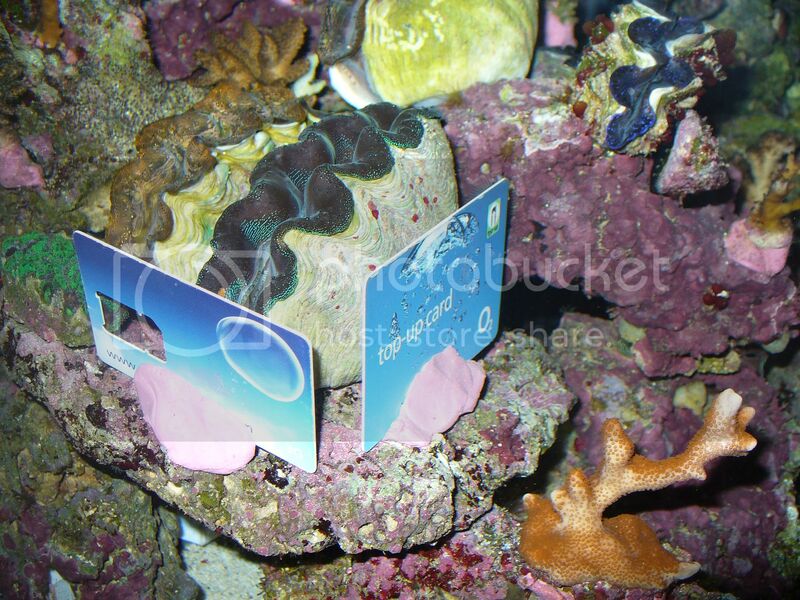 an old credit card) to box in clams up to ten days to ensure they they firmly attached to a flat surface. 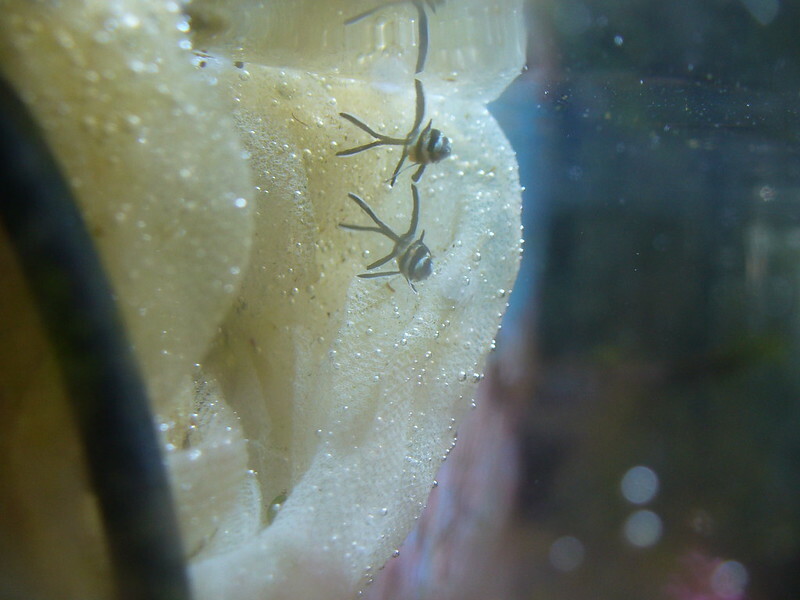 Two of the clams shown below were attached to the flat rock in the picture in October 2011 and still remain attached to the same rock to this day despite a tank move and being taken out of the tank many times with their rock. 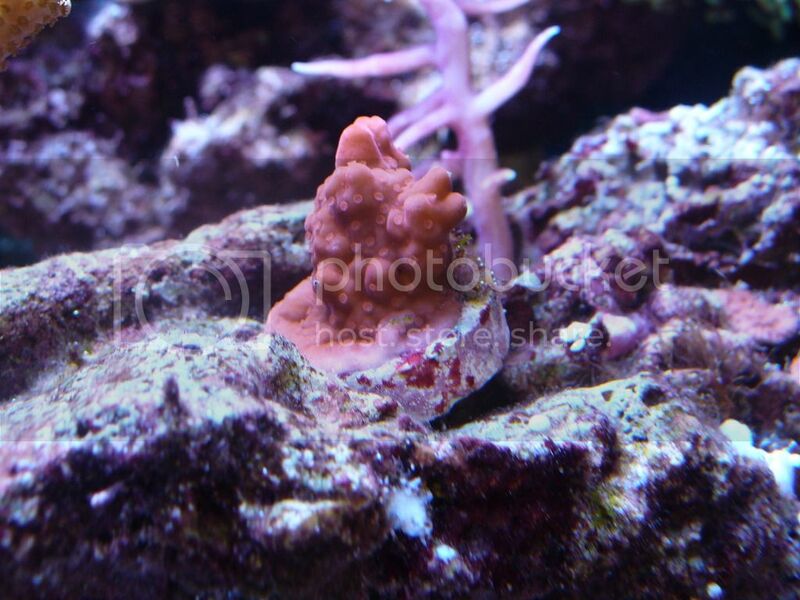 Sadly, my clams have been suffering from pyramidellid snails since May 2012. The common advice is to mechanically remove tiny snails on a regular basis, which I did for many months. However, the snails kept coming back. 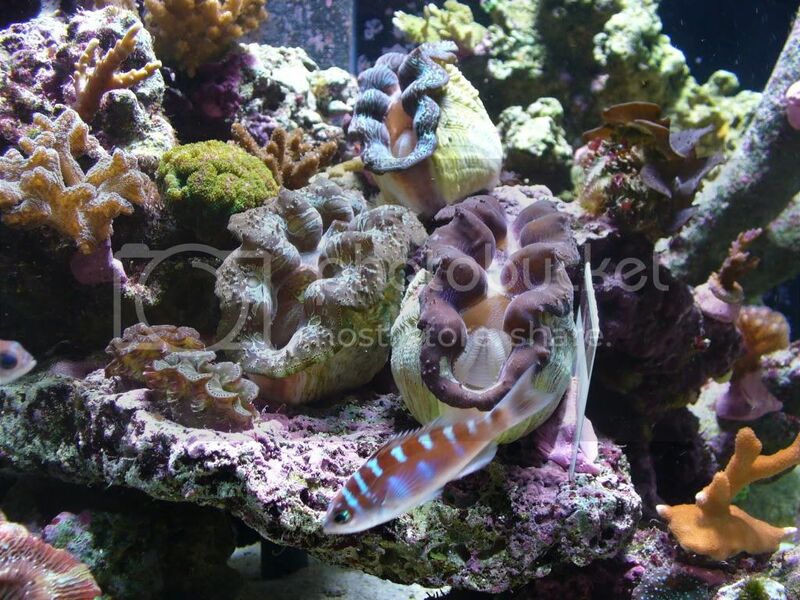 I then purchased a H. melanurus wrasse, which had a huge impact on the snail population until it sadly died suddenly. The sudden increase in the population in Week 4 coincides with death of my H melanurus. 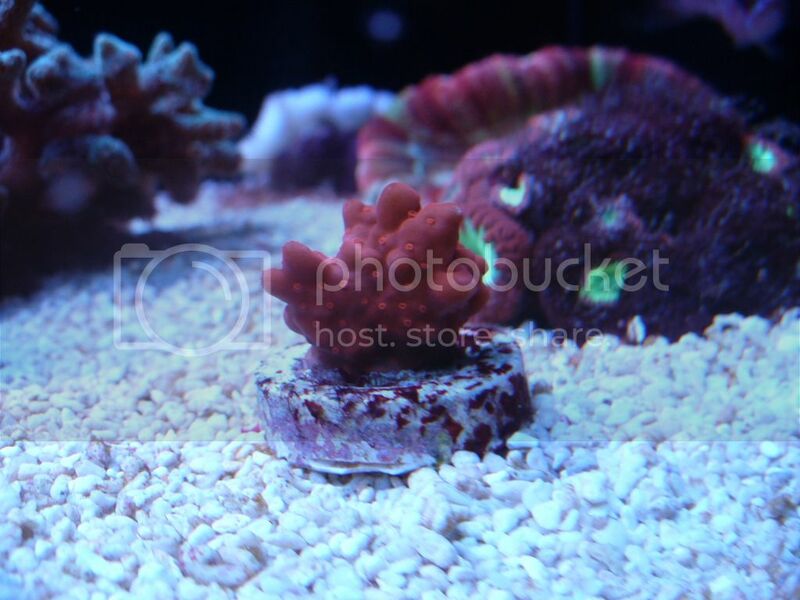 My experience suggests that even though certain wrasses are very good at removing snails they cannot eliminate the entire snail population because snails evade wrasses by hiding in the sand, in rock structure and even underneath clams. Having realised this I removed the sand bed completely and snail population dropped very significantly. With the help of my latest wrasse, H. hortulanus, close inspection of clams at night time only reveals a very small number of clams once every few months. This breakthrough was only possible when I removed the sand bed completely. Having said that I am actually very pessimistic about the possibility of removing pyramidellid snails from my tank completely. I argue that once you have these snails, whatever measure you take is not going to go beyond population control. Therefore, what is important is keep the pyramidellid snails number very low, so that these creature will cease to be a thread to clams. This is what I have been doing since May 2012. The fact that my clams have been alive and thriving since the discovery of these tiny snails back in 2012, support my statement. Last edited by DiscusHeckel; 05/07/2014 at 06:35 PM. Today, I have started to experiment with Nualgi Aquarium (free trial) and dosed 2.2 ml into my tank. I will report the progress. Last edited by DiscusHeckel; 05/27/2014 at 11:07 AM. 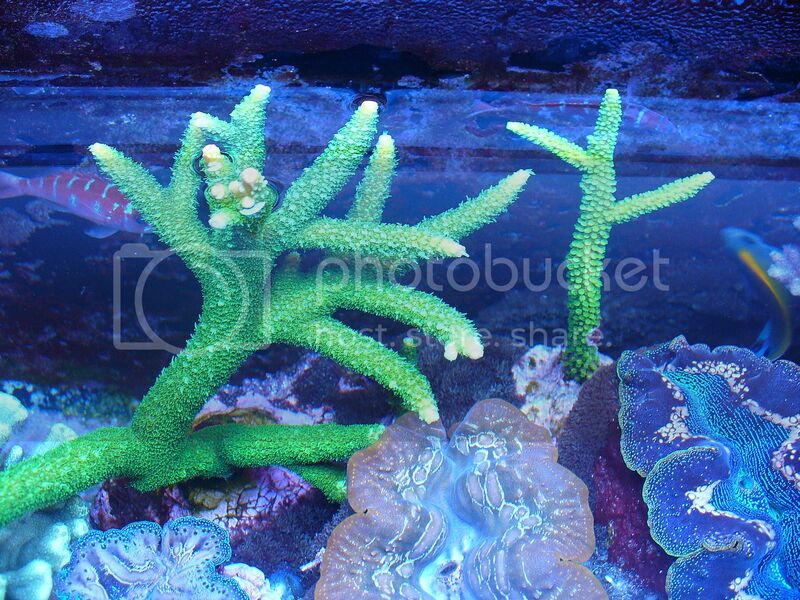 I had to remove some branches from the blue tip acropora in the first pictures as it started to smother the blue tip Acropora carduus (? ), causing browning of its tissue due to shade. Wow. I hope mine ends up being 1/8th as awesome as that. I am sure your tank will exceed your expectations as long as you do things slowly. Very impressive build, you should definitely not consider yourself a novice. Looking great Bulent! Nice growth on the Acros! Thank you Sahin. First and foremost congratulations on your forthcoming fatherhood. My tank has changed considerably since my last update. 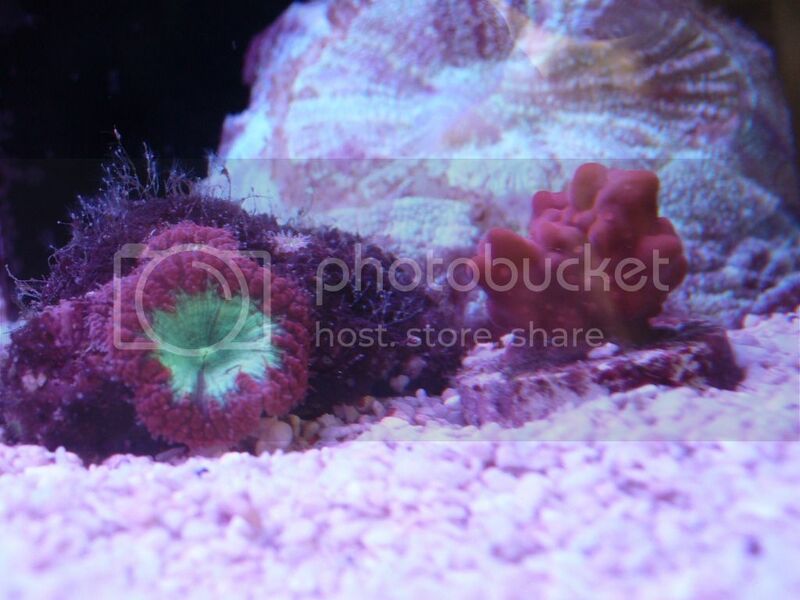 I got fed up with making compromises to accommodate different kinds of corals as well as clams over the years and not being able to keep the kinds of wishes I always wanted. 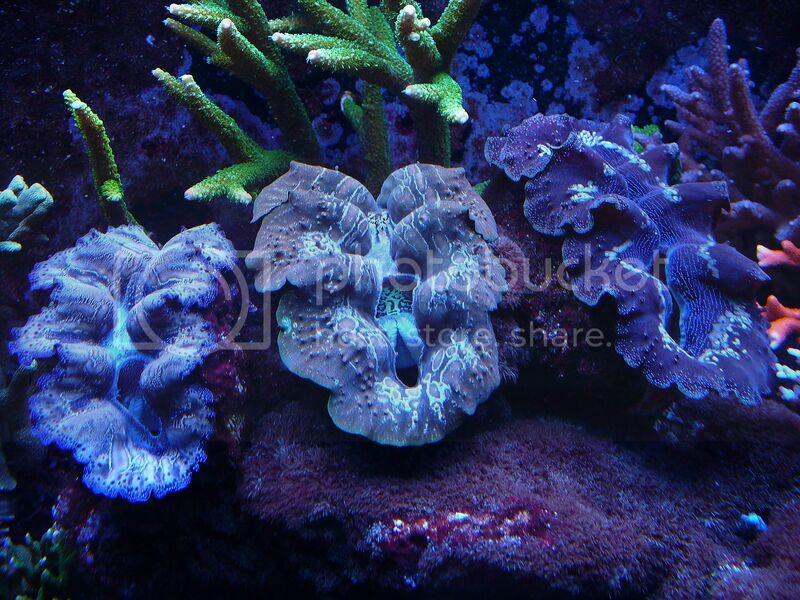 In the end, I made a decision a few weeks ago to go for 100% sps and as a result sold all my lps corals and clams. This then gave me an opportunity to rescape my tank and I went for an open space minimal aquascape design. Finally, I started to purchase fish, which I would not remotely consider before, such as butterflies and a banner fish. Lets see photos of the new scape. 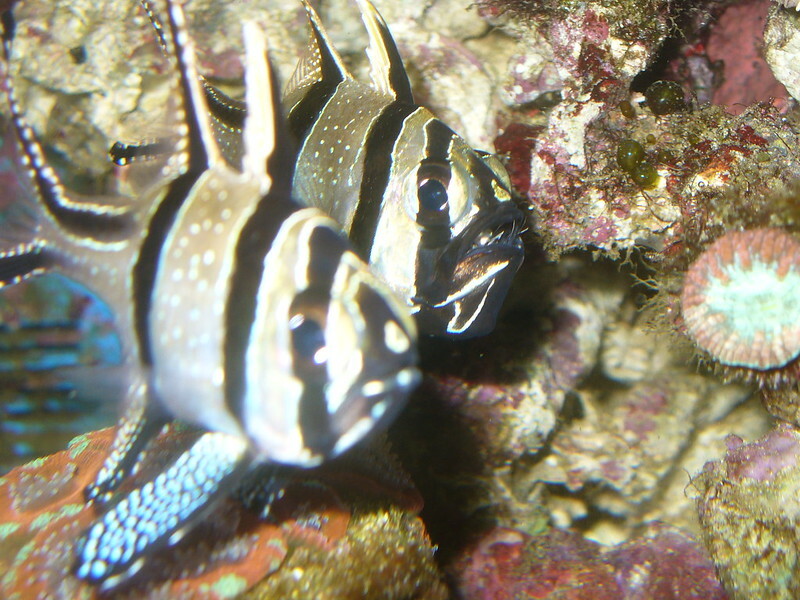 There is a new fish addition to my tank, Heniochus acuminatus. He is a picky eater, which seems to be only interested in eating fresh clams, fresh squid and fresh mussels. The other change is that I have swapped all my ATI tubes with new Pacific Sun tubes. 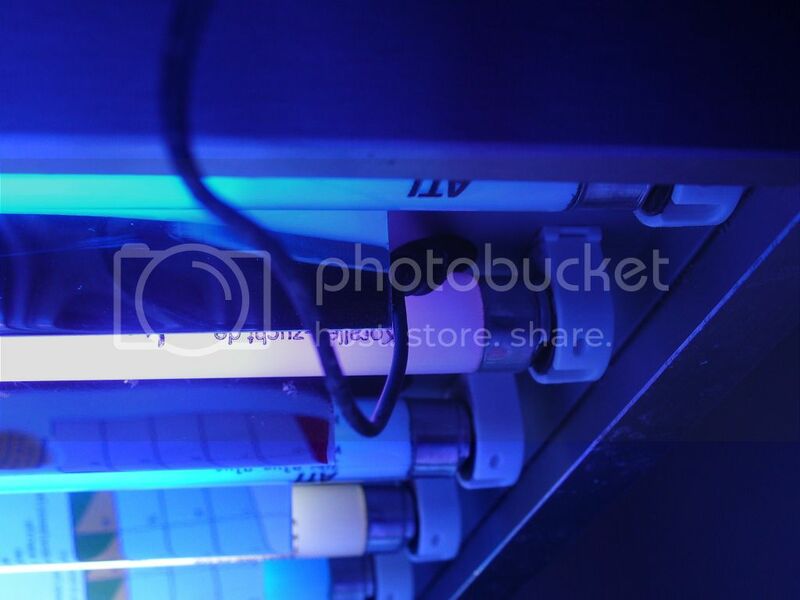 My current combination is 3 X PS Spectra + and 3 X Crystal Blue. Finally, I have added sand bed (Caribsea fijipink). Surprisingly the sand bed remains clean, thanks to two conches, which seem to sweeping the sand bed constantly. Sorry I missed your post. Thank you. Looking great Bulent! You have PM regarding the PacSun tubes.